Topics: Engagement, Wedding, Nature, Temples, Other, and Let Me Know. Age: The domain is 11 years and 11 months old. aaronbarkerphotography.. Dancing family statue in front of SLC Temple - Aaron Barker .. The site has about 2 users daily, viewing on average 1 page each. 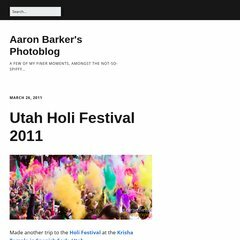 Aaronbarkerphotography.com's server IP number is 67.205.62.201. It is hosted by New Dream Network Llc (California, Brea,) using Apache web server. It has 5 nameservers, including dns4.name-services.com, dns5.name-services.com, and dns1.name-services.com. PING www. (67.205.62.201) 56(84) bytes of data.